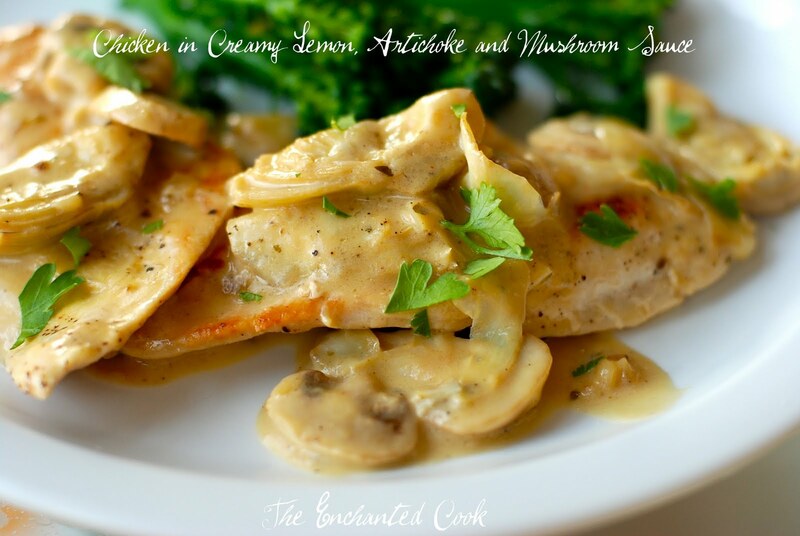 Thin chicken cutlets in a sumptuous lemon, artichoke and mushroom sauce...Mmmm, just what I was craving! Recently, my husband and I were walking down the street in our neighborhood perusing menus at all the Italian restaurants looking for something to eat. Of course the "chicken in lemon sauce over pasta" dishes always draw my attention but I never order them for fear of the high fat content. So, no wonder when I was thinking of something to make at home shortly thereafter, the thought of a creamy lemon sauce kept creeping into my head. 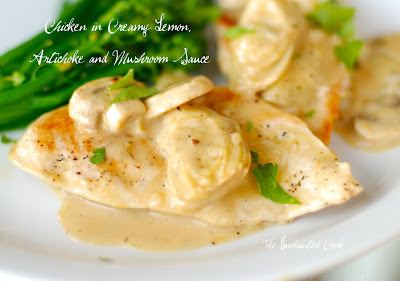 The brightness and tang from fresh squeezed lemon juice really makes for a great sauce and complements chicken nicely. Marinated artichoke hearts and fresh mushrooms only added to the beauty, texture and flavor of this dish. I used a minimal amount of cream which made for a little bit of a thinner sauce, but I thought it was perfect. I also opted to leave out the pat of butter that is often used to finish sauces, which made it a little healthier, too. 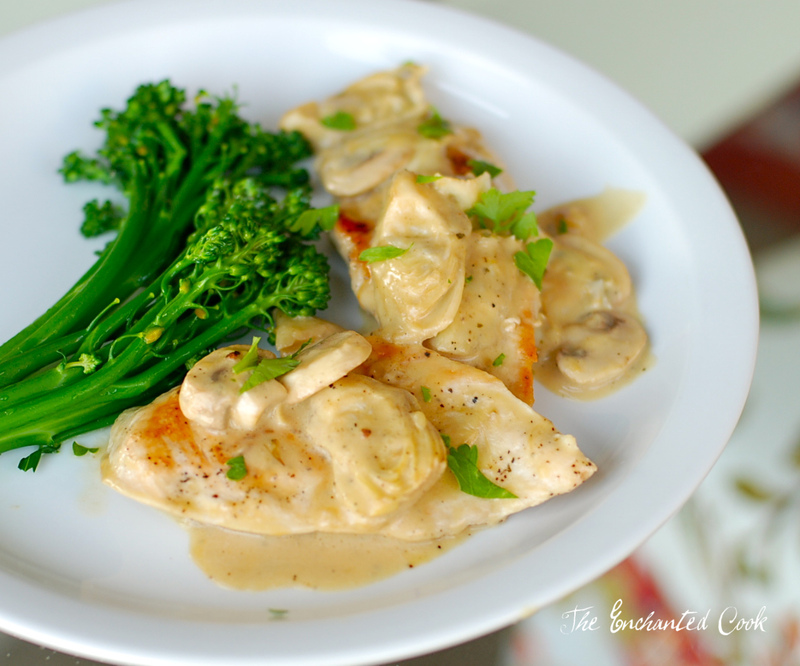 Lastly, I chose to serve it with fresh steamed broccoletti with a nice squeeze of lemon, instead of heavy pasta. It was a delicious meal that felt more decadent than it was. And the thin cutlets cook quickly so this dish was easy to put on the table in under 30 minutes. Season the chicken cutlets with salt and pepper on both sides. *Cook's note: If you can't find chicken cutlets, just buy regular boneless skinless breasts and cut horizontally through the middle to make two thin pieces. Heat a large skillet to medium-high and add olive oil, then add the chicken and lightly brown on both sides - about 2-3 minutes per side. Remove from skillet and set aside. Using the same skillet you cooked the chicken in, turn the heat down to medium and the add chicken broth and juice of the lemon. Stir and gently scrape bottom of pan to get all the little bits of flavor loose. Add the cream and stir or whisk to combine, then allow to come to a simmer. Sprinkle in the flour and stir continuously until sauce begins to thicken - several minutes. Next add the artichoke hearts and mushrooms and allow to cook for a few minutes until the mushrooms start to soften slightly. Last, add back in the chicken and allow to cook together for a few more minutes. Taste for seasoning and add additional salt and pepper if desired. Serve alongside steamed vegetables. 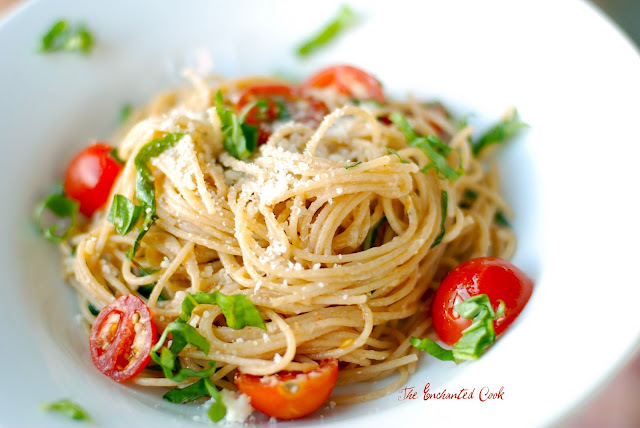 Or if you want to splurge a little - serve over a bed of whole wheat angel hair pasta along with a side salad. We used to make this when I was a kid - it was economical, easy, and versatile. We called it Hobo Stew, even though it's not a stew at all. It's a sirloin patty topped with fresh veggies and seasonings, then sealed up in a packet of foil and grilled. Grilling it all together in these packets melds the flavors, caramelizes the beef, and allows all of the juices to stay in tact. It's simple to make, and simply delicious. Every time I make these I wonder why I don't make them more often - they're so darn good! Take 2 long pieces of aluminum foil and criss cross them, one under the other and place on the counter. Do this 3 more times, making a total of 4. Divide the ground sirloin into 4 equal parts and make large, flat patties out of each. Place one patty in the center of each criss-crossed foil and season with sea salt, pepper and several dashes of Worcestershire sauce. Seal up the packets by bringing the four ends of foil up to the top together and folding over. Leave room inside the packets for air to circulate and steam. Place packets on the heated grill and leave for 30-45 minutes. When done remove from grill and place each packet on a plate and serve. This dish is so versatile you can tailor each packet to suit your picky eaters. You can use any veggies you like, in any quantities you like. I normally like to add cherry tomatoes to mine (although I didn't have any this time) and whatever veggies are in season. Don't let the plain look of this dish fool you - it's absolutely delicious. And I mean delicious. Fresh, garlicky, and parmigiano-y...Wow. Ina Garten's recipes never disappoint. And it couldn't be easier to pull together. The only thing is that you'll need to plan for macerating the tomatoes. Ina recommended 4 hours and that worked just fine. It's minutes to prepare the tomato mixture, then you just let it sit out at room temperature for the 4 hours. 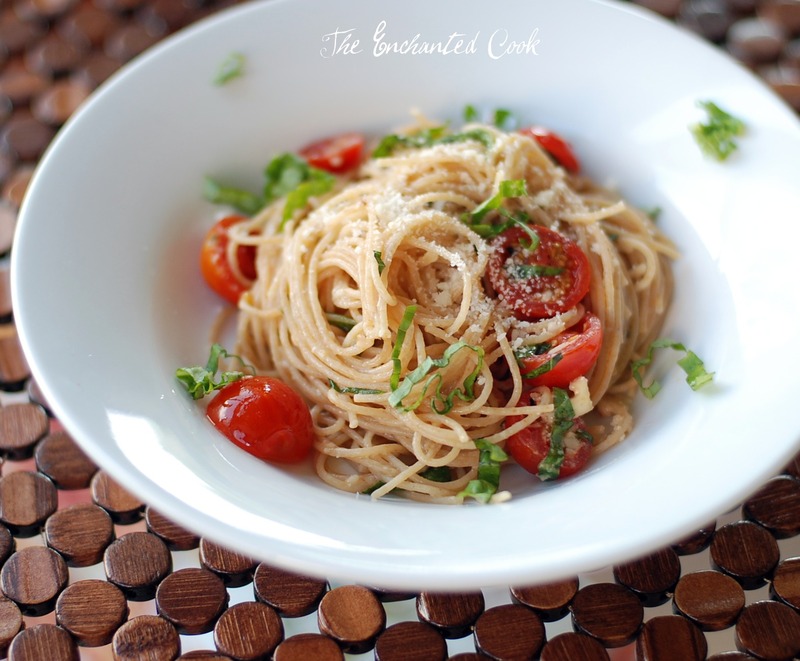 The last thing you do is cook the pasta, which takes about 3-4 minutes to cook to al dente, then toss it with the tomato mixture and serve. Ina's recipe is meant to serve 6, so I halved it and it was plenty for 2-3 people, especially with a side salad. I also opted for whole wheat pasta and chose organic ingredients when possible. Lastly, I recommend splurging on Parmigiano Reggiano, it makes a huge difference in flavor. In a large bowl, place the cherry tomatoes, olive oil, garlic, basil, crushed red pepper, salt, and pepper, and toss to coat. Cover the bowl with plastic wrap and leave out at room temperature for about 4 hours. When you're ready to eat, prepare the capellini pasta according to package directions in heavily salted, boiling water (no oil). I don't recommend adding oil to your water because it keeps the sauce from sticking to the pasta. I love this pasta! I also use it in my Sesame Noodles recipe. Once the pasta is done, drain and add to your tomato mixture. Then add the Parmigiano Reggiano and toss to coat. Taste for seasoning and add more salt and/or pepper if needed. Garnish with fresh basil and an extra sprinkle of cheese if desired.